I’ve got a couple of Halloween parties this weekend, neither one of which calls for a costume. This either means I am getting old, or I need more festive friends. This also means I need a way to infuse some Halloween fun without being the only one in the room drinking wine in a Teenage Mutant Ninja turtle costume. Ahh. Nothing like a neck full of hand bones to break in the autumn spirit. I found a baggy of skeleton hands at the craft store for $3.99. Thought I was going to glue them to the rim of a tray to use as a candy dish, but backed out in favor of putting my time into costume jewelery (that happens a lot around here). Twenty minutes and an old silver necklace later, it’s a big freaky statement necklace collar thing. If you are familiar with jump rings, you know how this went down. 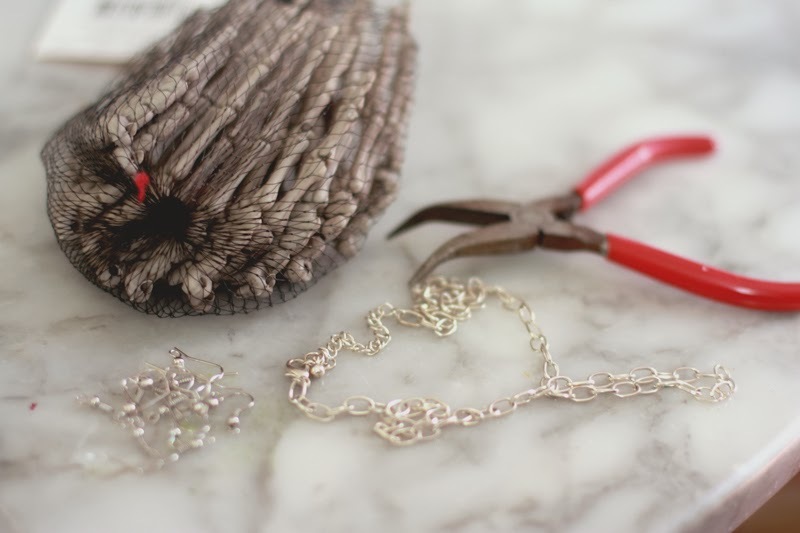 If you are not familiar and need a crash course in basic jewelry making, this is it. This project has shown me that just about anything can be added to an old necklace with some simple jump rings. I mean, skeleton hands are only the beginning. What about, say, coasters? Silverware. Baby shoes. Bottle caps. Old copies of Sports Illustrated. If you can hole it you can hang it. I feel Christmas comin’ on! OH my that necklace is awesome!!! Please stop by my Halloween Linky and post it! I would love to feature it! New follower! I LOVE it! 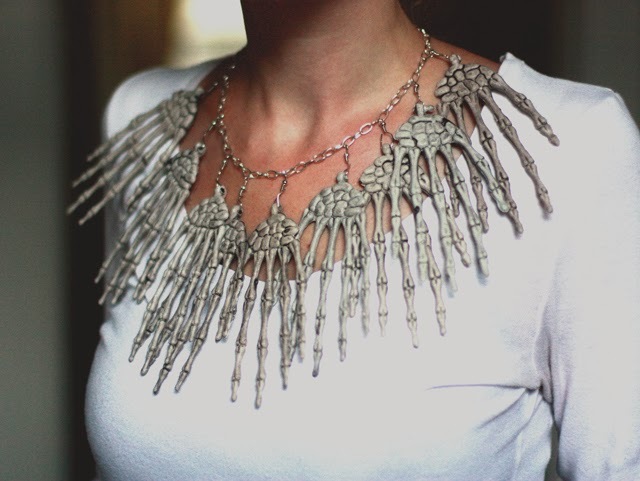 I am going on a cruise in January and may have to make something like this as a statement piece to wear! I’m not goth, I wish I was, but this would look so cool on formal night! It would liven the place up! Dang, yo. Cruise wear. I had not even considered such. How can we bring a nautical theme to this? Oh the creepy skeleton hands will be awesome on the cruise! But, yeah, cruise wear. Um… Little boats, little hula girls? those aren’t jump rings, those are earrings! can you post a close up of them – that’s genius! Yes, oh yes. Me too!!! Thanks for the idea. That is epic. EP. IC!!! It looks absolutely amazing on you. I love reading your posts because not only do I find something creative and interesting, they make me laugh! So glad I stumbled onto your blog. Peaches, what store did you get them from?